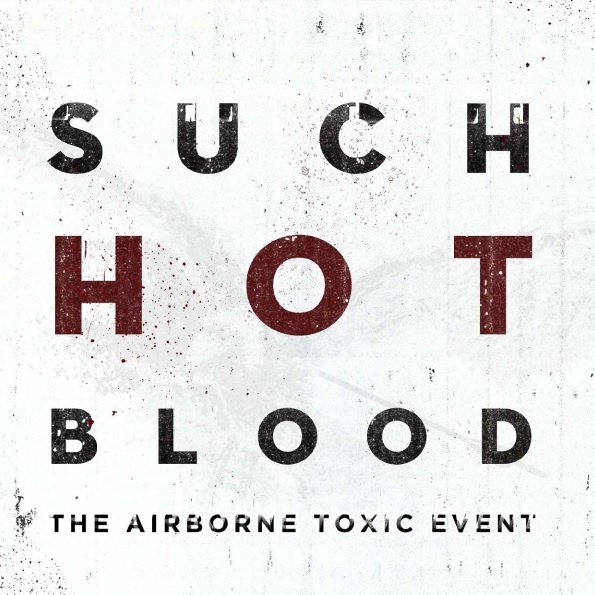 Every since hearing their self-titled debut album some 3 years ago, given to me to listen by my daughter, I have fallen in love with The Airborne Toxic Event. Not a play goes by that I don’t get chills when I hear “Sometime Around Midnight”. Their second album “All At Once” was packed with hits and songs that I loved just as well as their first. So when I heard they had a new album coming out this year, it immediately went on my “MUST GET” list. And after a good 20 listens to the entire album, I can say that it’s another stellar work of musical talent. So far, my favorite song on the album is “Safe” with it’s repeat of ‘Everything’ in the chorus, and how the music flows together and how the strong the vocals are. I also like the first single off the album “Timeless” as well as the opening track “The Secret” Not a single song on this record is a slouch. Each one has it’s own moment of brilliance. If you’ve liked their previous works, you will like this new set of 10 songs. I’ve seen this band live 3 times now and each and every time, I come away from the performance in awe of the talent these five musicians have displayed on stage for a good two hours. The set pulled mostly from their first two albums, which was fine by me and most of the crowd for this sold out show. Instead of closing with their stellar “Sometime Around Midnight”, they played it in the middle of the show. A nice touch for a band that doesn’t do the same thing over and over. 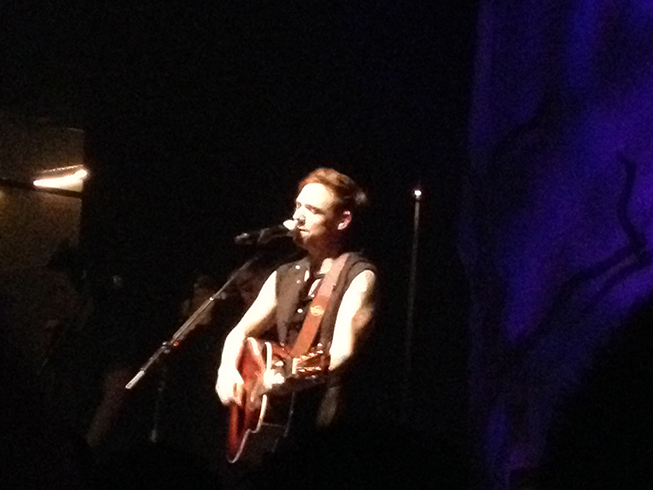 A smattering of new songs, which I would eventually hear, was nice. “Timeless” live is a very powerful song that moves you in many ways. 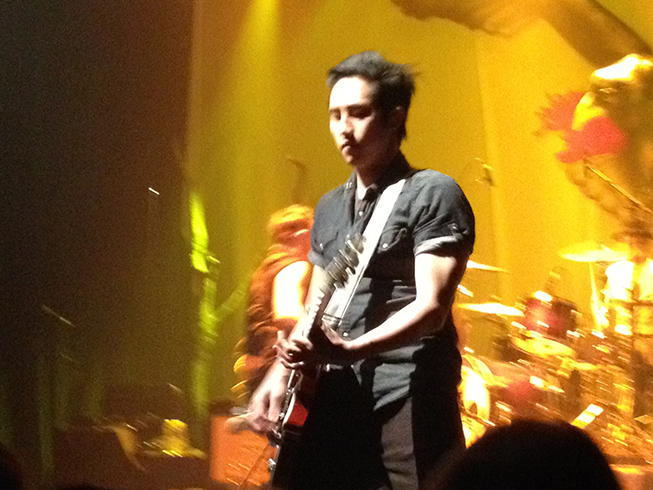 “The Secret” also works well live, with Steven Chen’s blistering guitar work. The stage backdrop of a wounded raven was pretty cool, along with a well executed light display. The entire band works very well together, often switching up instruments, like Steven on both guitars and keyboard. 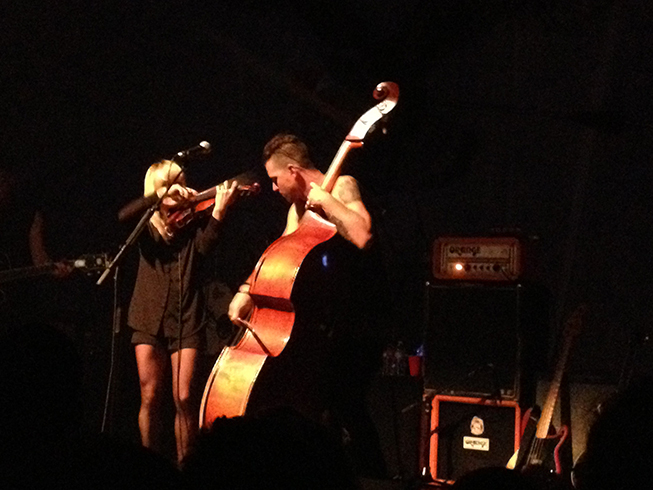 Anna switches between violin and keyboards and Mikel plays guitar and handles the lead singer duties. Darren stays behind the drum kit for the most part. 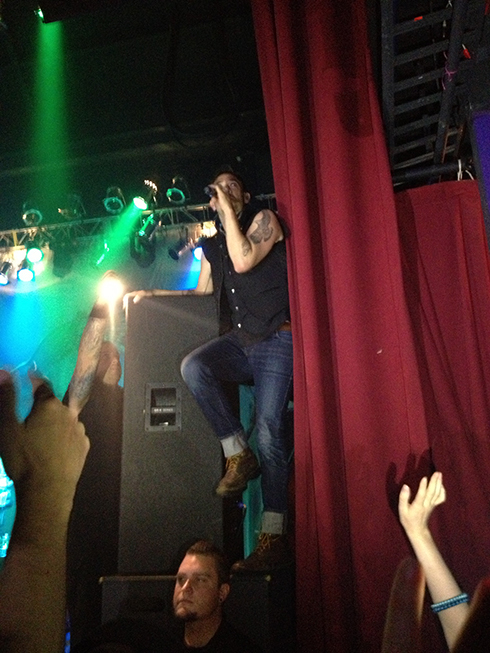 Mikel is all over the place during the show, as evidenced above in his attempt to climb the speaker on the right side of the stage. I was about 5 people the front on the right side, being close enough to capture not only the image with my camera, but also the energy of the audience excited to see the charismatic leader of this band engage the fans. Steven Chen is the lead guitarist and has mastered this instrument quite well. I admire him most of the show, not for any other reason other than he knows his work and knows how to just stand there and make it all come together musically. 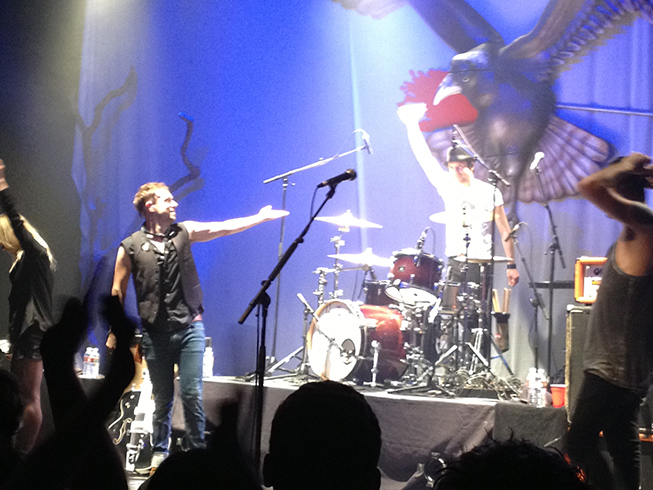 Towards the end of the show, the band breaks into several covers, like Bruce Springsteen’s “I’m On Fire” and Tom Petty’s “Breakdown” The Clash gets honored with a spot on version of “I Fought The Law” and then the ending encore of Airborne’s own “Missy” from the first album gives the audience one last chance to meld with the band in a sing-a-long. Again, musically, this is a modern band you should be seeking out, both on album and live in concert. I look forward to my many other times I get to see them live and the many plays their new album “Such Hot Blood” will have on my digital devices. Music Monday: Anyone Remember Body Count? 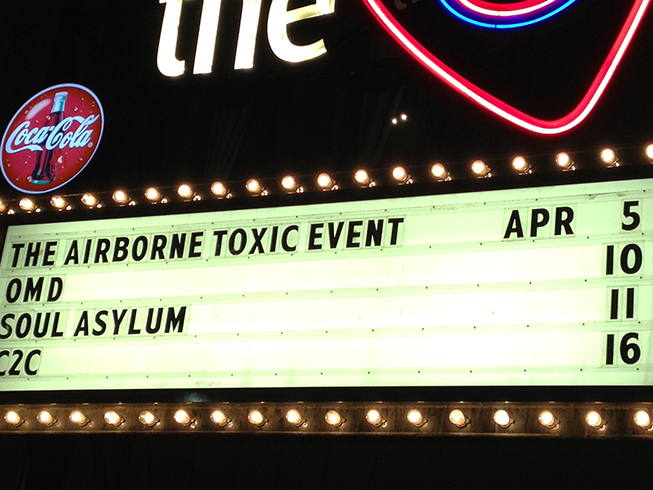 I don’t think I’ve ever heard anything by The Airborne Toxic Event. They’ve always been one of those bands that I say to myself “yeah I should get around to listening to them at some point” yet never quite do. Will fix that. I really think you would like them. It’s a great sounding band. Live, they are really really great. Highly recommended each and every time I post about them.